The lottery established the Dream Fund to enable courageous, groundbreaking new projects. Archbishop Desmond Tutu of South Africa and Dutch Prime Minister Mark Rutte presented the Dream Fund cheque to the directors of Peace Parks and WWF at the lottery gala. The total amount of money that was distributed this year to its 93 beneficiaries was a record amount of €302 million. Rewilding Europe became a beneficiary of the Dutch Postcode Lottery in February 2013. The initiative receives an annual donation of €500 000 for a period of five years. The Lottery support is very important for the rewilding activities in the six rewilding areas: Western Iberia (Spain/Portugal), Danube Delta and Southern Carpathians (Romania), Velebit (Croatia), Eastern Carpathians (Poland/Slovakia) and Central Apennines (Italy), and also for the possible expanding of the initiative later this year to four news areas – Odra Delta (Poland/Germany), Greater Laponia (Sweden), Thracian Mountains (Bulgaria) and one more which is still open for a nomination. 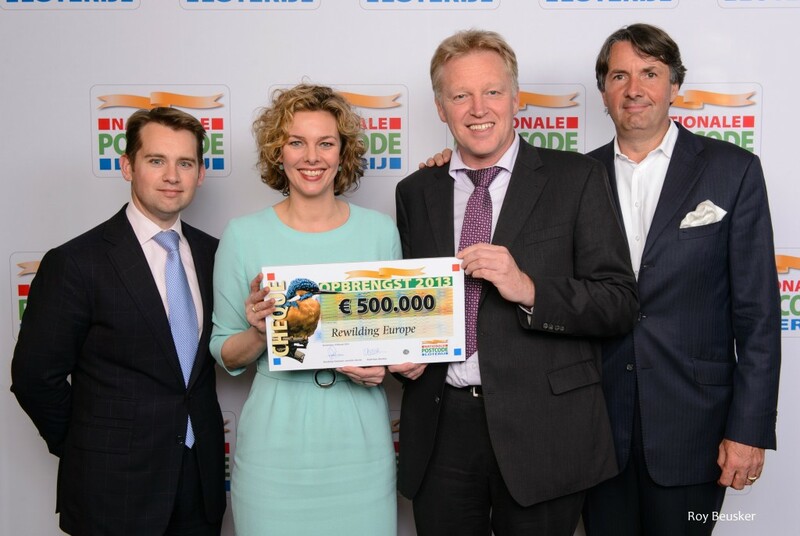 “We are very grateful to the Dutch Postcode Lottery for their support to Rewilding Europe”, says Frans Schepers, Managing Director of Rewilding Europe.’’ It enables us to build our exciting initiative and show the great support of the lottery to conservation in now seven European countries where we are working’’. The Dutch organization ARK Nature, one of the founders and key supporters of Rewilding Europe, received additional funding for a special project (€1.8 million) in addition to its annual funding (€0.9 million). Each year, millions of euros in charitable donations are made possible by the 2.5 million people who play the Postcode Lottery. Half the price of every ticket goes to charity. Increased revenues this year have enabled the lottery to give away almost €12 million more than it did in 2013. Novamedia/Postcode Loterijen is the second largest private charitable donor in the world.